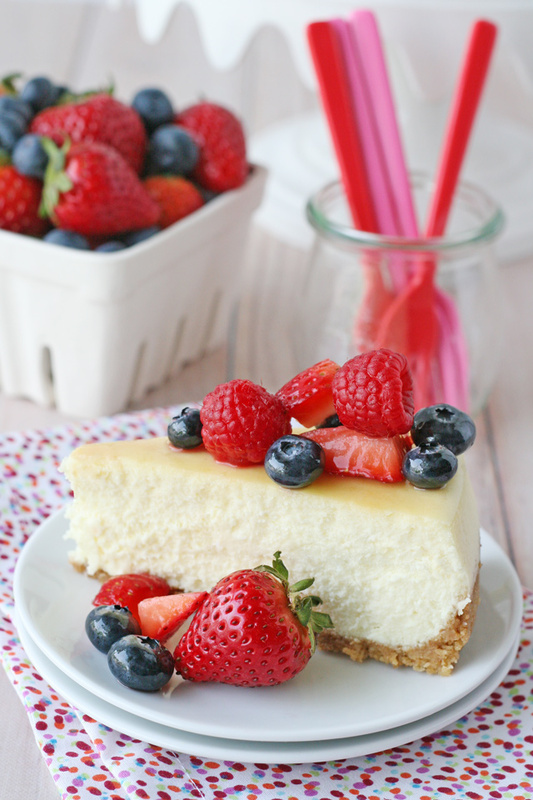 This Perfect Vanilla Cheesecake recipe is a delicious classic that’s anything but boring! Rich, creamy and flavorful… everything a cheesecake should be! And see that nice flat, crack-free top? I promise it’s possible (and easy)! This will be a recipe you can come back to time and time again and mix and match with an endless variety of toppings! 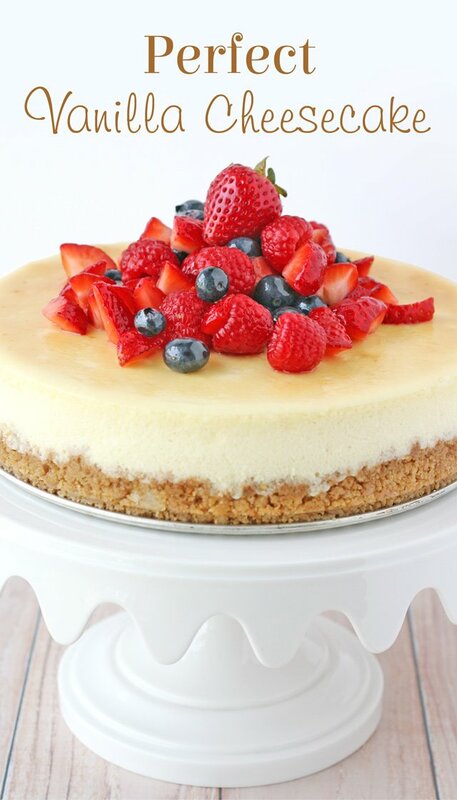 I topped this cheesecake with fresh berries, but other delicious options would include lemon curd, caramel sauce, hot fudge, toasted coconut, canned pie filling (such as cherry or blueberry), fresh peaches and more! And if you’re a cheesecake purist (like my husband), this perfect vanilla cheesecake is flavorful and delicious all on it’s own. This recipe starts with one of my favorite kitchen staples, Challenge Cream Cheese. I know when I use Challenge brand cream cheese I can depend on consistent quality and fresh taste. If you’re not sure where you can find Challenge cream cheese (and butter) near you, use this helpful map. 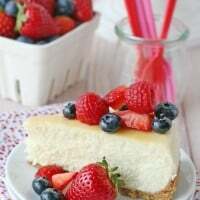 The not-so-secret “secret” to a smooth, crack-free cheesecake is to bake the cheesecake in a water bath, and then allow the cheesecake to cool very slowly (as described in the recipe below). The moist air created from baking the cheesecake in the water bath also helps keep the cheesecake nice and creamy. It’s one little extra step that really makes a big difference in the finished recipe! 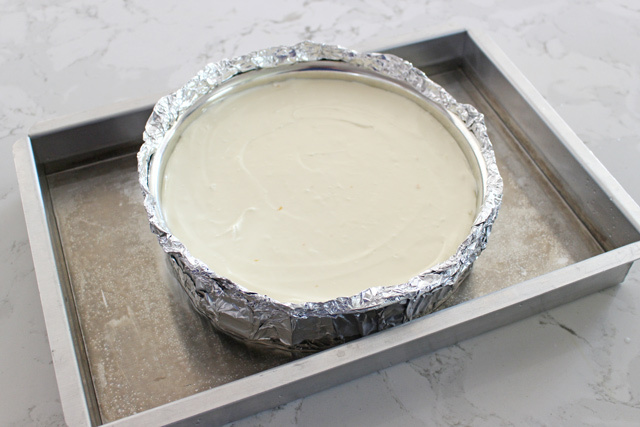 To create the water bath, simply wrap the cheesecake pan with two layers of foil, set inside a large roasting pan (or cake pan), add about an inch of HOT water to the pan, then bake as directed below. Rich, smooth and creamy, with no cracks! 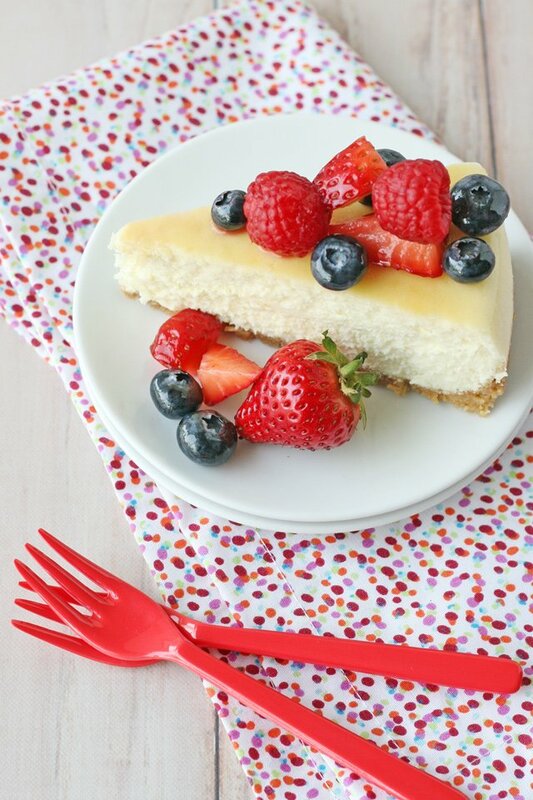 This classic vanilla cheesecake is delicious as is, and also perfect for adding your favorite toppings! 2. Melt butter in a small bowl, then set aside. 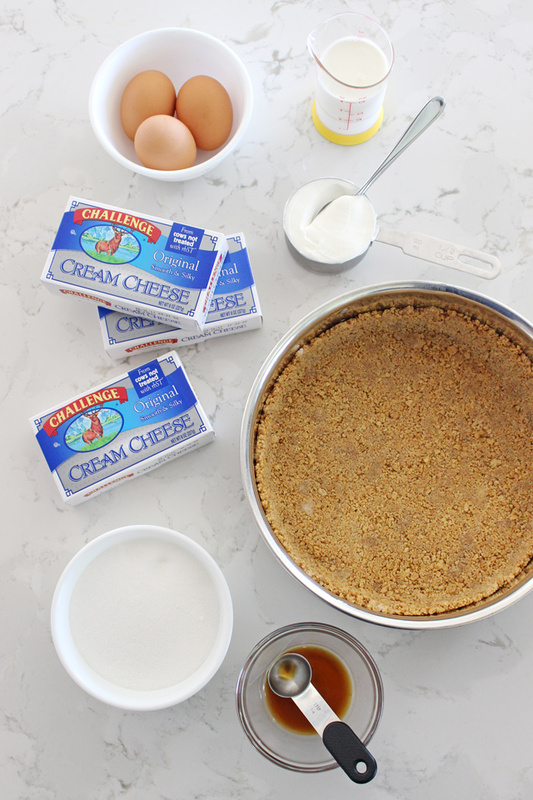 Crush graham crackers and then add graham cracker crumbs, sugar and melted butter into a medium sized bowl. Stir together until well combined. Pour mixture into a 9" springform pan and use the bottom of a glass or measuring cup to press the mixture firmly into the bottom and about 1 inch up the side of the pan. Bake in pre-heated oven for 10 minutes, then set aside to cool. 1. Gather all of your ingredients on the counter so your cream cheese and eggs can warm up to room temperature. 2. In the bowl of an electric mixer, blend cream cheese until smooth. 3. Add sugar and continue to blend. Add eggs, one at a time (while blending). Add sour cream, heavy cream, vanilla, and lemon zest. Blend until all ingredients are smooth and well incorporated. Pour the cheesecake batter into the prepared crust. 4. Prepare the cheesecake pan to be baked in a water bath (as follows). 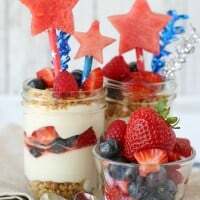 To prepare water bath, wrap the cheesecake pan (bottom and sides) with foil, (you may need to criss cross two sheets of foil) so that no water can get into the pan. Place the foil wrapped cheesecake pan in a large roasting pan or baking dish, then pour HOT water into the roasting dish until the water is about 1" deep. Carefully move to oven and bake. 5. Bake cheesecake in pre-heated oven at 325*F (note this is reduced from the crust baking temperature) for 60-65 minutes, until the outside edges are set, but the center still jiggles a bit when nudged. At this time, turn OFF the oven and open the oven door part way. Allow the cheesecake to slowly cool in the oven for 1 hour. Move cheesecake to the counter and cool an additional hour. At this time, move the cheesecake to the fridge (cover with foil) and chill for AT LEAST 6 hours, or overnight. If you plan to top the cheesecake with caramel or chocolate, omit lemon zest. For the fresh fruit topping shown, wash, then chop berries as desired, add to a small bowl and drizzle with about 1 tablespoon of honey. Stir and put in the fridge for at least 15 minutes and the fruit juices will combine nicely. This looks de-lish! Another winner! I wish I had some of this right now! Looks amazing, thank you for all your hard work providing us with great recipes. 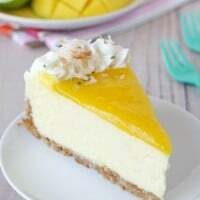 I don’t like using water baths for cheesecakes, so am wondering if this yummy looking vanilla cheesecake can be baked without one at a lower temperature and a longer bake time. Thoughts?? Thanks! 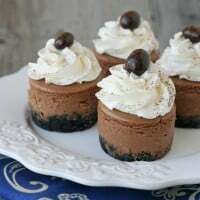 I’ve only made this recipe (and other successful cheesecakes) using a water bath, is there a reason you’re opposed to doing it that way? I know that some people fear the crust getting soggy… I haven’t had that problem, but I have seen a water bath used and a plastic crock pot liner used around the cheesecake pan to create one extra layer of protection (in addition to foil). Please feel free to experiment, but I’ve only made the recipe as listed. I find water baths unwieldy, hard to handle, no guarantee against cracking (important when you serve the cheesecake “naked” as we do), and more trouble than they’re worth. 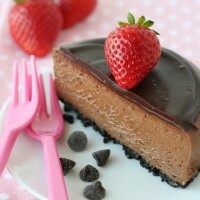 We like the dense texture of a New York-style cheesecake and find waterbaths make the texture too creamy for our taste. That all makes sense now =) We might be at odds on this recipe then, because I was purposely trying to create a smooth and creamy cheesecake! Of course I totally understand that everyone has different preferences. Please feel free to experiment. I do think one key in preventing cracks is allowing the cheesecake to cool slowly (in the oven, then on the counter before moving to the fridge). Happy baking! I agree that cheesecake needs to cool slowly and then *must* refrigerated overnight for best flavor and texture. Thanks again for your help! Looks delicious! Can it be frozen? If yes, for how long? Hi! I have not experimented with freezing this, and I’m not sure I would recommend it. Feel free to experiment. It does last several days (I’d say 3-4) in the fridge, just make sure it’s well protected from the air, and that there are no odors in the fridge that would seep into the cheesecake. Happy baking! Hi Glory, Do you think I could split this recipe and make four – 4” cheesecakes? Yes, for sure! You’ll definitely want to adjust (reduce) the baking time. The description will remain the same (as listed in the recipe) to describe when the cheesecake is done. Happy baking! I’ve never made a cheesecake before. I don’t have a large stand mixer, I only have a hand mixer. Will a hand mixer work? Yes, a hand mixer will work just great. Just be sure your cream cheese is softened to room temperature (let it sit out at least 30 minutes), or microwave at 50% power for maybe 30 seconds to soften, but be very careful not to actually heat it or melt it much at all. And then be very sure you blend ONLY the cream cheese until FULLY smooth before moving on to the other steps. Happy baking and happy Thanksgiving!